Poems, Quotes and Short Stories - Navneet Singh Chauhan: Reservation Policy of India makes me rethink, Is India a Secular Country ? If you are an Indian, you must have read in class 7th in Social Studies, that India is a Secular Country. And if you are not then too You must have heard of it. In a Secular Country it is expected that every citizen gets equal rights. Our country claims that it is a secular country but when I try to think the other way then sorry I don't think the same. You are in class 12th (higher secondary education). You are too good in studies and eager to become a doctor. And you have a friend who is also a classmate of yours, who is an average or below average in studies. You both have many things in common. You both have your own owned house, you both are neighbors. You both have got equal respect and other things in life. And when exam results comes you scored 92% marks, and your friend just 51% marks. And You do not get admission in Medical college even at self financed college and your friend gets admission in Medical college that too at Government financed. Thanks to the Reservation Policy of India, that did a great justice to your hardwork. The only difference between you and your friend was that he belonged to a reserved caste like ST (Social Tribe). Your dream is churned out and the one who didn't have thought to be a doctor just becomes a doctor because he got admission. Is this a justice ? Will you still think the same ? Is India a Secular Country ?? 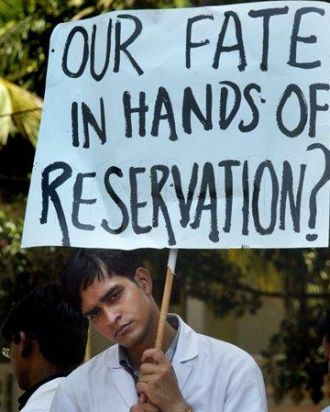 Every day thousands of millions of dreams are churned away by this reservation system of our country. Many undeserving candidates enjoy the benefits at the same time. I always wonder what these doctors and engineers who are not that qualified will give to our society. They might even take life's of people as they do not qualify to the dignity honored. Think a student who somehow passes the exams becomes a civil engineer because he belongs to certain reserved caste, followed by he gets a job in government as construction engineer again because he belongs to certain caste. He never studied hard because he was assured that he has pool of opportunities as he will get out as reserved candidate. He has insufficient knowledge. And then he gets a job and then he works on major projects. This Engineer will construct bridges, airports, grounds like Commonwealth games, Who knows he may also construct a Nuclear power station. I fear these are bound to have some problems or errors. This may kill masses. I am not sure where this reservation policy will lead us. Ohhh the other side, what about the open caste students, job seekers ? To be a good doctor, engineer from a reputed institute becomes too hard or just a dream. Getting a government job is next to impossible to them. Thanks to our Great Reservation Policy. There are many many people who belong to open castes, who are very poor. Who do not get right education, right job. At the same time there are many many people from other castes, Who are rich, have everything in there life, they are no more socially out-casted. Still they eat up these poor open castes candidates seats. Though open caste candidate may have scored higher, though they are more talented, though they are comparatively poor and have faced more social concerns then these reserved castes. The reserved caste candidates get that seat which the other guy actually deserves. After Independence the social status of reserved castes is increased, there is no more discriminations between people based on castes in most of states of India. But still we have this Reservation policy, which indeed is creating discrimination. So this is high time we need to revise this Non-secular reservation policy. I am in an opinion that this caste based Reservation policy should be taken back to its fullest. And there should be no reservation policy. This will give equal justice, rights to all the people. Let there be a healthy competition, may the best win. Let there be no reservation, Let there be no discriminations. This will make India a truly SECULAR country. And then Every Indian will be truly proud of being an INDIAN. HELLO..! I am Asking a Question on Facebook "Questions". Please provide your valuable opinion by CLICKING HERE. Welcome to the most corrupt nation in the world and its evil policies, my dear friend! @Anonymous: Thanks for the warm welcome.. :) but we need to make India the way our Legendry leader Bhaghat Singh ji thought. I will keep writing on such concerns. This reservation policy has given nothing to open caste people except mockeries. And the worst part is year by year increase of reserved seats. perhaps we are the only nation in the world were people fight to be called backward rather than forward !! ye..thats what..we had few of our classmates who in spite of no attractive % got into medicine. Now imagine the kind of doctors they are or rather let me put it that way, the false proud they carry on their sleeves and flaunt about themselves in their community that they are doctors now!! Of course I never deserved to be a doctor but neither did they! there were much deserved people whom i know lost their confidence after 12th and regained it only after a lapse of time! If the reservation policy continues than I won't be surprised when half of the youth migrates to some other country because of a better education environment there which allows them to flourish. In all I am totally against caste based reservation. However income based reservation where only 30% of the seats are given out might be the way forward for a huge country like ours. Hello Mathur you are right. Reservation policy might be a good reason why indian student's going out for studies in good numbers, also there are more opportunities. I also support income based reservation but it should be no more then 20% is what i think. You are right Rudreksh Ji. Yes the reservation should not be heredity. Once used it should not go the next generation as the previous generation would have developed using it. I strongly believe reservation if any should be on economy based. Because poverty does not comes seeing the Caste and Religion. In present senario when we luk then we realised that govmt. Sud make a law dat general categary student cnt get admission n job in india at any cost.. Exactly!Even i am also thinking in same way.that Is India secular? as we are given reservation to the caste basis and not on the Financial basis.so how can we say that we are secular. With respect to the thought & provocative negation as it is evident in the above write up . More importantly not only is it misleading in many dimensions but also not backed up with deep thought & understanding. Comparing General Category Students with so called Reserved Category Students is as an Idiotic way to compare as comparing bananas and oranges despite they are fruits. Agreed that some students do get undue advantage and this is unfair to some extent but if you think in the similar manner as by quoting an example as my friend here have quote let me give you still better example. Lets suppose two twins are born , with twins I assume the are genetically identical in their so called capabilities and qualities let one of them be X & the Other be Y . Lets now suppose that if after they were born the chid A is given all the nutrients, food and vitamins and resources to grow well physically & intellectually well & Child Y be deprived of all of the same nutrients and goodies. so now at the age of say 12 when they are supposed to be relatively competitive and well grown now both the Child x & Y are given same quality of food , nutrients and what not . NOW you All So called Professors of equality tell me one simple thing . Which one of the above Chid will be more competitive, strong and well best ??? No rocket science is required to figure this out . Most of the childs growth wether physically , mentally or even emotionally is done in its early age (some research say its in its early 6 yrs) , so it is evident that no matter what you give latter to improve the other child who was mall nourished after the age of growth , there cant be any equal comparison on performance or rather any ground between the one who has been enjoying the quality life since early age and the one who has been given extra efforts to grow after extreme late stage. No some Intelligent people will argue how on earth this example is correlated the ongoing argument of RESERVATION IN INDIA . Well see most of the people or rather all of the people who have been down trodden due to the earlier cast system which prevailed in India for centuries & now one cant just justify the injustice done to them for centuries by providing reservation for meer 60 or so years, its if not inhuman then utter injustice & thinking against reservation while you & your ancestors have enjoyed worldly prestige and privileges is even shallower a thought. Its so shallow to think that just because I have to get the medical seat or something the other should not . And please quote appropriate examples It never happens that a 51 percent SC Students gets a seat while a 92% Gen category student didnt get one . It does happen that a 88% or so SC student gets the seat in comparison with 90-92 % in realistic situations. Quoting such ambiguous non realistic example just make the rift between the cast MORE n more & people who do tht are the one who actually support cast system & discrimination on the long Run . I personally do oppose reservation on cast system , I personally believe reservation is instrumental in India's success however it should be shouldered responsibly and should be disbursed in a proper structured manner. And being the young dynamic Indians we individually think before we make anything that will have greater impact of the rest of the population. I have too much to say but should sum this up. God knows y sm ppl don't get dis simple logic behind d system ....!! Hi Mac Rumors - Sorry for so late response. I really liked your example in this case both will be of same caste as they are twins. One is hit by poverty and other is rich. In any case they belong to the same caste. Assuming they are from reserved caste then both of them will get the reservation which is fare for the poor fellow while the other did not required and that fellow will have unfare advantage over the poor. Assuming the second condition both are from open category both will not get reservation. this is right for the rich but injustice with the poor. hi dr pankaj. No one can defend them all they can tell us is a 60 to 100 year old story.